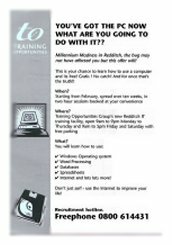 Training Opportunities of Redditch and Wolverhampton is one of the new breeds of community trainers who, whilst catering for the needs of the local unemployed and disadvantaged, also have a dynamic programme of commercial courses targeted at the commercial sector. By targeting both sectors the standard and style of training had to be pitched at the SME and commercial market. Rather than run dual delivery systems Training Opportunities committed themselves to offer commercial standards of training and accommodation to all. Training Opportunities received funding from the government to provide 600 places on a 60-hour introduction to IT course. The contract was awarded on the proviso that it started in two weeks from notification of funding. Training Opportunities contacted Metropolis 2 to advise on how to complete the task of recruiting 600 people in two weeks. The solution recommended was to produce an A5 insert printed single-colour both-side and place it in the local free sheet identified as having the best coverage of target audiences by the Metropolis 2 media department. The insert was then designed, written and printed in 36 hours and shipped to Worcester for insertion under the strap line "Now you've got it - what are you going to do with it?". Since the campaign was launched in January, this was an opportune time to address new gifts and support children in their studies. The administration and reception staffs were trained in taking calls and logging interest ready for the calls to start. Needless to say, the strength of the proposition worked and it reached the proposed target audience. As a result not only was the course fully booked but there was also a waiting list formed to replace any dropouts. This was an essential performance for such a government-funded programme where full occupancy is critical.